This paper is NPP Australia Limited’s submission in response to the ASX’s consultation paper “CHESS Replacement Scope and Implementation Plan” issued on 28 April 2018. The New Payments Platform (NPP or Platform) presents a significant opportunity for the ASX and the securities industry. The Platform’s combination of 24 x 7 faster funds availability and enriched data capability can drive considerable operational and process efficiency improvements. Interoperability of ISO messaging between the ASX and the NPP will help the ASX to realise its aim to deliver improvements and efficiencies to its stakeholders in all areas associated with payments. An API Framework (currently under development) will further assist interoperability between the two platforms and the ability to initiate payments. The NPP has been designed and built in a way that it can meet the needs of an evolving digital economy. Additional functionality and capability will be developed and delivered over time which will further enhance the utility of the Platform. Capability currently under development includes “request to pay” functionality, as well as the ability to support recurring payments linked to a customer consent authorising those payments. In addition to helping the ASX to drive efficiency and process improvements in the specific areas associated with the CHESS replacement plan (as highlighted in this paper), the Platform could also be used for other payment related processes to drive greater automation and straight through processing, such as for corporate actions, distributions and broker related processes. The NPP was designed to support a 24/7 modern, digital economy. It provides a fast, flexible and data-rich payments system for Australian consumers, businesses and government departments, enabling them to make faster, smarter and simpler payments. The NPP brings enormous potential for future payments innovation through its data capability, open-access design and unique layered architecture that can support multiple and competitive products or services. Recently launched to the public in February 2018, currently there are 65 financial institutions offering real-time payments services to their customers (either connecting directly or indirectly to the Platform). We expect a further 20 financial institutions to be onboarded to the Platform over the next 12 months. The NPP is a truly world-leading platform that has become the reference model for other international real-time payments solutions currently in development. The Platform enables the real-time movement of money, account to account, 24 hours a day, seven days a week. NPP payments are settled line-by-line in real-time by the Reserve Bank of Australia, effectively eliminating settlement risk typically associated with deferred net settlement arrangements. Built using the global standard ISO 20022 message schema, the Platform has extensive data rich capabilities. With more than 1400 data fields in the ISO clearing message, additional data can be carried end-to-end together with the payment or via a url link to externally hosted documents. In addition, ISO20022 provides a clear standardisation for how to organise data information and data formats (field lengths, codes and character sets) that can be exchanged between parties. With the ASX moving to adopt ISO 20022 messaging as part of the CHESS replacement project, not only is there interoperability with the NPP, there is also a significant opportunity to further enhance current capabilities and processes, drive greater automation and support straight through processing, for the ASX and the wider community. The NPP’s Addressing Service, PayID, enables payments to be directed to an account using an easy to remember alias (a PayID) which has been linked to an underlying bank account. PayIDs can be easily moved from one bank account to another along with all of the associated payments linked to a PayID, which means there is no need to maintain up-to-date details for a customer’s bank account. Currently four alias types are supported on the platform – phone number, email, ABN and an Organisation Identifier, with the ability to add to these over time with new alias types. The Platform also continues to support payments using BSB and account numbers. Additional functionality and capability will be rolled out over time which will further increase the utility of the Platform. Future planned services include the ability to attach a document with a payment or have a url link to externally hosted documents included in the message, “request to pay” functionality and the ability to support recurring payments linked to a customer consent authorising those payments. An NPP API framework (initially focused on payment initiation requests and PayID look ups) is currently under development. This API framework would further assist with interoperability between the two platforms and facilitate the development of securities payment initiation services. There are many similarities and parallels between how the NPP works as underlying infrastructure and what the ASX is seeking to achieve through its CHESS replacement plans. 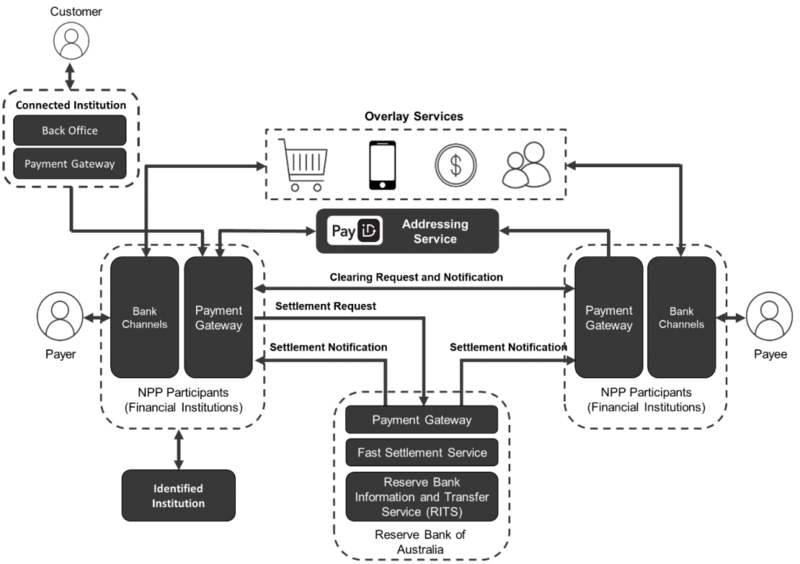 The NPP is a distributed architecture of customised payment gateways which are hosted by financial institutions who have chosen to connect directly. Payment transactions are processed and routed between the NPP payment gateways and the RBA’s Fast Settlement Service using the ISO 20022 message structure. The Platform has very high levels of availability and resilience, with the NPP payment gateways being required to respond to messages within seconds. The Fast Settlement Service is a new service of the Reserve Bank Information and Transfer System (RITS) specifically supporting settlement of NPP payments. The Fast Settlement Service provides line-by-line settlement of individual settlement requests received via the NPP payment gateways, validating each request against the paying Exchange Settlement Account Holder’s balance. Settlement then occurs irrevocably and unconditionally. Organisations who want to be able to send instructions to initiate NPP payments can choose to connect directly via an NPP payment gateway, housed in their own environment. The ASX has the option of considering becoming an NPP “Connected Institution” which would bring certain associated benefits of security, performance, direct access to the PayID Addressing Service for PayID resolutions and the ability to send messages directly to all connected NPP participating financial institutions. Overlay Services sit on top of the Platform’s infrastructure to offer different or tailored customer value propositions. Osko, developed by BPAY, is the first Overlay Service and was made available to customers when the NPP launched to the public in 2018. The ability to support multiple products and services makes the Platform flexible, extensible and well positioned to support payment needs into the future. The NPP’s approach to overlays is similar in nature to the ASX’s intention to provide tools for external parties to develop applications and services to leverage the CHESS replacement platform and functionality. With line-by-line, real-time settlement via the Reserve Bank’s Fast Settlement Service, the Platform eliminates settlement risks by supporting payments any time of the day, any day of the year with no cut off times. Payments are not delayed because of defined batch settlement times and can be settled after business hours or during weekends. With no value limits imposed across the infrastructure, the NPP can support transactions of any value. By using common ISO 20022 messaging, the NPP can easily integrate CHESS specific data and carry that data through the payment messages to improve efficiency, reconciliation and support straight through processing. Finally, the fact that significant numbers of ASX Payment Providers are also already participating in the NPP, and NPP’s open access architecture, presents an opportunity to realise synergies between the two platforms. With its real-time payment and data rich capabilities, the NPP can be used by the ASX to deliver an automated electronic process for the acceptance and payment of entitlements, which will generate considerable operational improvements for the ASX and its stakeholders. Transactions can occur in a more timely manner (effectively with no settlement risk), reconciliation effort will be reduced and the quality of data will be enhanced. Interoperability between CHESS and NPP through ISO20022 messaging means detailed entitlement acceptance data can be passed across the infrastructure alongside the payment. This provides the holder’s settlement participant and the issuer with the ability to easily reconcile payment with the specific entitlement offer. NPP also offers the capability for payments to be addressed by a PayID such as an email address, ABN or Organisational identifier rather than using a BSB and Account number which could further improve the payment process for both shareholders and participants. The ability to enable acceptance and payment processing to occur any time of day, any time of the year, may also provide broader benefits across the securities ecosystem for issuers, participants and shareholders as well as other stakeholders such as custodians. For example, facilitating overseas sourced acceptances to meet a local record date processing cut-off. Payment initiation messages could be sent from the ASX, containing holder details and data such as holder number, entitlement number, shares accepted, etc. NPPA would be happy to work with the ASX and its stakeholders to develop an automated electronic payment process to support entitlements. As with the entitlement acceptance processing, the NPP can facilitate improvements to the manual processing issue for mFunds. With enhanced data capabilities and interoperability between the systems utilising ISO20022, as well as its real-time availability, the NPP can provide the benefits the ASX is seeking to deliver to mFunds customers and stakeholders. Future capability currently under development, including the ability to support recurring payments linked to a customer consent authorising those payments, could be used by the ASX to deliver a more streamlined and automated payment process. The NPP was developed and funded collaboratively by thirteen Financial Institutions (ANZ, ASL, Bendigo and Adelaide Bank, Citigroup, CBA, Cuscal, HSBC, Indue, ING, Macquarie Bank, NAB, RBA Banking and Westpac). NPP Australia Limited (NPPA) was formed in December 2014 to oversee the build, operation and management of the platform. © 2019 NPP Australia Limited. ABN 68 601 428 737 All rights reserved.